He's at it again. Six days after defending his national pursuit champion's title, Graeme Obree cut a swathe through the opposition to take top honours at the men's national `25' time trial championship in Sussex. NO contest. With a breath-taking performance Graeme Obree (Scotoil-Specialized) led a British Olympic team clean-sweep of the medals to win Sunday's RTTC national 25-mile time trial championship in Sussex by nearly two minutes. His time of 48 minutes 55 seconds smashed the course record by over four minutes. Obree, the world individual pursuit champion, became only the second rider in the title's history to beat 50 minutes with the second fastest championship time ever in British time trialling's blue riband event. He was just 10 seconds outside Chris Boardman's record winning figures of 1993. Pounding a monster fixed gear of 52 x 12 (117 inches) on the same bike he rode to his fourth successive national individual pursuit title at Manchester six days before, Obree thrilled the crowds of spectators lining the lay-bys along the A22. They easily identified his fast approaching figure. Stretched out in the now famous `Superman' riding style, Obree gave a demonstration of raw power which demolished even his fellow Olympians. Recently crowned RTTC 10-mile champion Rob Hayles (Team Ambrosia) lost 1-48 on Obree to take the silvermedal in 50-43, while at 2-03 Chris Newton (North Wirral Velo) was content to take the bronze medal with 50-58 and lead his club to the team victory. It was a perfect morning for time trialling, blue skies and a stillness in the air, the silence broken only by the sound of rumbling disc wheels until traffic began to build up for the later starters. Gliding the length of this undulating single-carriageway course with the same apparent ease he laps a track, Obree picked off five riders in front, one by one. As one Obree watcher observed, he took the roundabouts - there were 13 traffic islands to negotiate - like a skier on a downhill slalom. Words fail to do justice to a performance which defies logic, for only two days before the title race at Uckfield, Obree was ill with a bad chest cold. He wasn't the only one, for Hayles, too, was still hoarse after barely recovering from bronchial problems which seem to have afflicted the Olympic pursuiters recently. But they didn't need excuses, which is just as well, for few if anyone around the undulating G839 course in this East Sussex CA promotion expected anything but the best from Britain's Olympic hopefuls who have benefitted from a preparation programme few others in the field could expect to match. Defending champion Richard Prebble (Wembley RC) was on a hiding to nowhere. He had little chance of winning a hat-trick of titles. Last man off at 120 and 10 minutes behind Obree on the road, Prebble was a massive 1-40 behind at the 13.08-mile turn, and finished fourth in 51-23, losing 2-28. 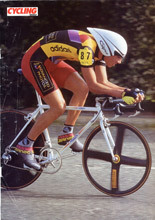 Chasing Prebble, as he did last year when he netted the silvermedal, was the amazing 41-yearold Geoff Platts (Coalville Wheelers) who finished fifth in 51-36. The pair could at least be satisfied with splitting the Atlanta alliance, leaving team pursuiter Matt Illingworth (Harlow CC) in sixth place in 51-44, just two seconds ahead of his clubmate Chris Ball, while another Olympic rider, Ireland's Phil Collins (Irish Heritage CC) filled eighth place in 52-17. 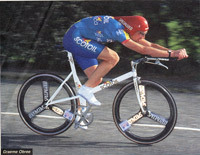 Collins, too, is a recent convert to the Obree `Superman' position. In a forlorn ninth was Stuart Dangerfield (Parker International RT), in 52-36. He's given up now on a place in the Olympic team but, ever the optimist, is now hoping to be selected for the world time trial championship. A few others briefly made their mark on the leader board. Tim Stevens, off number 30 at 6.30am, clocked 53-58. This was some way off the Team 2000 rider's course record which in 80 minutes would get knocked to kingdom come. Young Nic Hutchings (Vectis Roads CC), who has only been racing for two years, beat Stevens' record first, with a 53-18 that put him briefly at the top of the leader board. North Wirral Velo then hogged the limelight, first with Julian Ramsbottom who sliced four seconds off that 15 minutes later. Then along came his team-mate, old reliable Peter Longbottom, with 53-08. He stayed at the top for almost 20 minutes until Chris Newton raised the stakes with a 50-58. With things hotting up, Rob Hayles shaved a further 15 seconds off with his 50-43 but this too suffered meltdown. Even as Hayles's time was posted on the board, Obree, who had flown to the 13.08-mile turn in an incredible 23-07, was homing in like a heat-seeking missile: 48-55. It was a classic result for the Scotsman to which Prebble, the defending champion, had no answer. 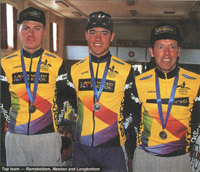 Suitably, the organisers were a match for the occasion, producing a computerised result sheet at the headquarters, made available as the applause rang out long and loud for Obree at the medal presentation. Team: North Wirral Velo-Kodak Advanced Photos (Chris Newton, Peter Longbottom, Julian Ramsbottom) 2-37-20. As fans queued up to have their photographs taken with him, new 25-mile champion Graeme Obree explained, between coughing, why he had chosen to ride fixed wheel instead of gears. Pull the other one, Graeme. Behind the flippancy as usual there was the Obree logic that has won him two world titles, the hour record, four national track titles and now a nice traditional British title, the `25' to go with the `50' title he won a few years ago. 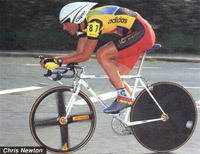 That would have stuffed other riders, but it didn't Obree. Obree has wanted to win this title for a number of years. What does it mean to him finally to achieve his ambition? The GAN professional remains both inspiration and tormentor for Obree, having beaten him to the title and wrestled him for the world hour record which Obree took first in 1993. Obree was generous in his praise of former double champion Richard Prebble, fourth. In fact they didn't get near him, all the more surprising given his health. A cold had gone to his chest. He could hardly speak at all at the recent track championships where, despite that, he still won convincingly. However, Obree had privately considered this. He said he had been in two minds on Friday whether to ride or not. If he'd felt as chesty on Sunday as he did then, he would not have ridden. `It would have jeopardized my entire Olympic preparation,' he explained. `But yesterday (Saturday) it wasn't quite so bad and today it was much better. And the rest, as the saying goes, is time trialling history. Like Obree, Robert Hayles has been poorly since the track championships. Adding the `25' title to his recent '10' championship wasn't on the cards. `I didn't expect to beat Graeme. I was pretty rough, too. I've done about three hours training this week. I went behind a motorbike for 10 minutes on Friday but I had to pull out. I've just ripped my chest to bits. Matt Illingworth's been bad and Shaun Wallace. It's the track at the national's, the pursuiting efforts. But to be fair, I woke up this morning and I felt 100 per cent better. That was a good sign. But I just had no power there. I was OK on the way out. I was riding just below what I'd have liked to have been riding at. But on the way back, after being mainly in 53 x 14, I was going through all the gears, all the time. I was in 17 and 18, at times. `When I caught sight of Paul Manning [who had fallen in the early miles -Ed.] right near the end, I was able to focus on that and that helped me. I was just short of him on the line. I caught two, I think. As leader of the RTTC circuit time trial series, he aims to win overall, and perhaps score a hattrick instead in the national `50' championship, which he has won for the last two years as well.